The eruption of the Mayon Volcano continues, and seems to have no signs of near end. According to the National Disaster Risk Reduction and Management Council, Mayon’s activity in the past 24 hours was characterized by near continuous lava fountaining, lava flow and degassing from the summit crater. Sixty-six (66) successive lava fountaining episodes, at almost 200 meters tall, since 8:08AM last February 9 have been recorded by the seismic network. 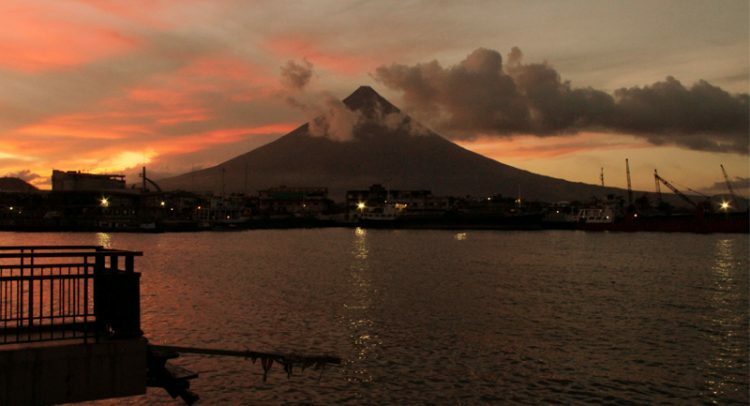 Mayon Volcano continues to intensify its hazardous activities. As of 6:00 AM, 09 February, a total of 23,032 families (88,490 persons) were affected in 61 barangays in the municipalities of Bagacay, Camalig, Guinobatan, Ligao City, Daraga, Tabaco City, Malilipot, Santo Domingo (Libog), and Legazpi City in the province of Albay. Of which, 19,233 families (72,972 individuals) are currently in 76 designated evacuation centers (ECs). While, 2,901 families (11,993 persons) are outside ECs. Moreover, a total of PHP 165,541,749.36 worth of damages to agriculture has been incurred in the province. This consists of agricultural crops of rice, corn, and abaca. In the past, families stay in evacuation centers from two weeks up to four months. 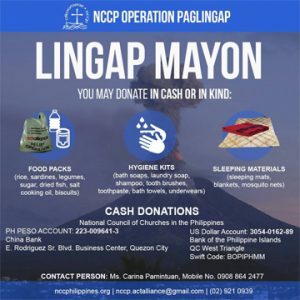 As an ecumenical response to the Mayon Eruption, the Council launches the NCCP Operation Paglingap, in partnership with Andurog Mayon (the Ecumenical Disaster Response and Management Committee in Albay) and the Bicol Regional Ecumenical Council (BREC). Drop-in center will be at the National Council of Churches in the Philippines headquarters at 879 EDSA, Brgy. West Triangle, Quezon City, Metro Manila. You may contact Ms. Carina Pamintuan at (02) 921-0939 or at 0908-864-2477. Let us move with compassion and be in solidarity with our brothers and sisters affected by the Mayon Volcano eruption.